In Post Captain, Captain Aubrey takes temporary command of H.M.S. Lively. On deck for the first time he is taken aback by calls from the rigging, which at first he first mistakes for a boy, but then is told they come from a "Java Ape". 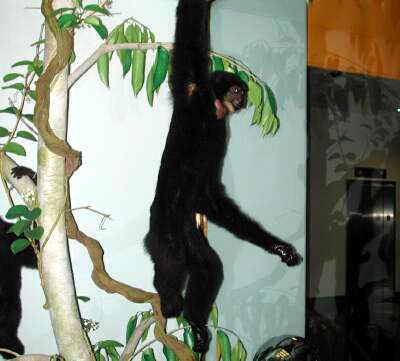 This is a gibbon - a siamang (Hylobates syndactylus, aver. wgt. 23 lbs.) - one of the species of gibbon and one that is very vocal, like the one on the Lively. Gibbons are lessor apes, distantly related to humans, who are great apes. You can see they are smaller with longer arms, adapted to spend most of their life in the treetops. They brachiate (travel arm over arm swinging from the branches) and do not jump from branch to branch, as do smaller primates. They form nuclear families, with the parents mated for life and the young raised by both parents. Gibbons are omnivorous, eating foods found in the forest canopy: leaves, fruit, seeds, insects, eggs, birds, etc. But the doctor and the Captain also had to content with another ape on the Lively, at least part of one.